Leading newspaper group, Lokmat Media Pvt. Ltd. joined hand with ‘M.K.Constructions’, ‘Khadke Classes’, ‘Indian Left Hander Club’ and ERA International School, Aurangabad, Maharashtra, India organized ‘Biggest Swachchta Abhiyaan’ across Aurangabad. In this event, 10,026 students from 156 schools participated and performed cleaning at their respective classrooms and school premises across Aurangabad on January 26, 2017. 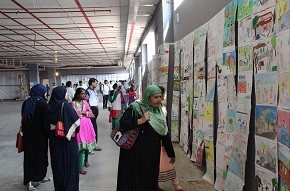 On the same day, 2017 left-handed students drew Swachch Bharat drawings and exhibited at Prozone Mall, Aurangabad. Comments for SCHOOL CHILDREN CLEANING MARATHON are now closed.